Zest Marketing | marketing services. made easy. As we all know the rules for branding have changed over the last 3 years. Social media, savvy consumers and our 24/7 news streams are all factors. Customer expectations of companies, profit and non-profit, are high. 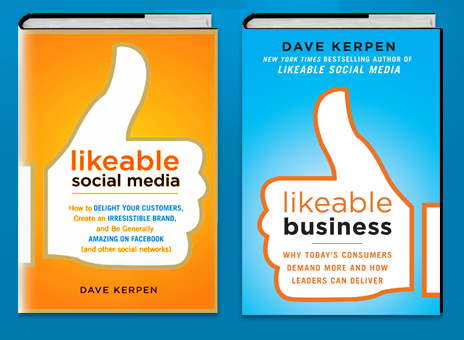 Recently an article by David Kerpen, “The 11 Principles of Likeable Business”, detailed many factors companies may want to consider striving for to deliver on your brand promise. One of them struck me as maybe the golden rule, Authenticity. Great leaders are who they say they are, and they have integrity beyond compare. Vulnerability and humility are hallmarks of the authentic leader and create a positive, attractive energy. Customers, employees, and media all want to help a person who is authentic to succeed. There used to be a divide between one’s public self and private self, but the social Internet has blurred that line. Likeable leaders are transparent about who they are online, merging the personal and professional life together. One of the litmus tests is to conduct the “Mom Test”–ask yourself, “Would I be comfortable to tell my mom about this? If you hesitate, figure out what you wouldn’t want to explain or what feels embarrassing and eliminate it. Maybe it’s the language you are using–drive it up or down a notch. You wouldn’t want to disappoint your mom, and you can’t afford to disappoint your customers. There are no gray areas here — if you’re unsure, drop it. Learn more about David Kerpen’s books here. There are many new tools and content sources out there. Often, I’m asked, “how do I know which ones to invest time?” or “how do I keep up” and ” is it worth it?” Here’s what I do. I wait it out–let the dust settle a little and then determine how best to interact so that I can determine the website, app or resources value to me and by extension to my clients. More times than not I’m surprised by peers who recommend tools within the content or social media space and they haven’t spent any quantifiable time to provide context. One tool that I have been using more often is Slideshare.net. The tap on my shoulder was when Linkedin purchased the community presentation sharing site for $118.9 million dollars in early May. Community based presentation tool to share and upload your presentation. Community-based. Always insightful to learn from colleagues but also it helps in discovering new content that you might not otherwise unearth. A trusted content filter is always welcomed in my busy day. Shareable content. Post it once and share it on Linkedin, Facebook, Twitter, WordPress and Blogger. Plus after uploading you can embed the presentation into a blog or website. All time savers. Also the site over time has become a valuable resource for many of us looking for information or presentations on a wide variety of topics. I often use it to brainstorm content angles, to get up to speed on topics I have only slight knowledge on such as quantifying ROI for UX. Great tool for sharing content across audiences for building thought leadership with your brand, extending industry credibility and also, with the advanced paid service, in generating leads. It’s a great audience if you are in the B2B space as a recent DemandGen Report article, stated SlideShare gets 40% more traffic from C-level executives than LinkedIn. So with the acquisition it’s a great way to extend your Linkedin B2B programs. Also, for your personal brand marketing why not integrate Slideshare and your related presentations into Linkedin. One aspect to take note of is that there is no quality gatekeeper. As we all know from the office, some of the presentations seem to be missing something as they are devoid of a presenter. So if you are going to be leveraging Slideshare as a content distribution channel keep this in mind as you build your presentation. The key here is to tell a great story. Often called the “You Tube for presentations” the site depending on your goals, could be a strong alternative to video and at a lower cost. You probably have existing content, repurpose a white paper, a conference presentation, past webinars and more. Consider re-purposing this content. And because you’ve read this far and may be curious but time-crunched. So here is a link to Slideshare’s Most Favorited of All Time presentations or take a tour here. Consider the all-too-common rationale: Since my customers are carbon-based life forms and they purchased my product, shouldn’t they be connected to everyone else who also bought my product, and for that matter, shouldn’t they engage in interaction with everyone who happens to “like” my product? Are we all deluded into thinking that current fans, followers and others are truly an engaged community? Aren’t most of them simply sending virtual high-fives our way in exchange for a promotion? What he is saying here, in my view, is this–what is your brand story? What does your company or organization stand for? Think bout how are you illustrating that elsewhere, say in customer service, in community service, do you advocate a lifestyle, a service? What is the outcome that your product or service promises? Are you simply broadcasting or do you take the time to listen and understand what your customers are saying about your product or service? Reinforce that through consistent actions and messaging in the social channels that make sense. (Clients are often surprised that you don’t have to do it all!) The difference between passive and active community management is brand sentiment. Measure it, understand and dial it in. Many companies simply feel that posting content and watching the likes and comments (if you are lucky enough) roll in is a sign of success. True success comes with investment in the form of consistent and active management –listening, responding with a conversation around the passions of your community. It’s tricky for sure, it’s not all about your brand, but in the end it can be. There’s only one, yes one, because the paradigm, owned by the search engines, has changed. The secret sauce for organic SEO, wait for it, is content marketing. Why wouldn’t you want more organic search as it’s “non-paid search” and with 70% of links search users click on being organic, well you get the picture. I have frequent conversations with many clients who have convinced themsevles that it is in fact all about pay-per-click (PPC) advertising and keywords. Yes that’s part of it but not all of it. It can be effective, in the short term. As soon as the media buy is complete it’s as if you weren’t there in the first place. One data point I often share is that up to 75% of internet users typically avoid paid ads on a search engine results page (SERP). Display, PPC and keywords are important but they should be used in tandem to a strategic content program which figures into the overall integrated marketing plan. Organizations must rebalance their marketing strategies in order to incorporate more content marketing. In fact a long-term organic SEO strategy built upon a foundation of creating valuable and relevant content builds organic search engine rankings. And remember, the whole of content marketing isn’t just social media outlets–LinkedIn groups, Twitter, FaceBook promotions etc . It also takes the shape of your public website, videos, online consumer events, consumer reviews, ebooks and more. As to what type of content and spend, it all depends on your goals and objectives. A few indicators can be found in a recent trends survey indicating US marketers’ 2012 digital advertising budget allocation is expected to mirror popular consumer usage trends, so more spending on sophisticated content tactics such as mobile and video. But that’s a discussion for another time–particularly mobile advertising. Ok, so you’ve decided to test the waters. You have a bread crumb trail for the makings of a social media meal–a Twitter account, a Facebook profile page even a Google+ account and a YouTube account. Now, what you need is a strategy. In the “old” days SEO was about keywords. Today it’s not about how many keywords but providing relevant and valuable content to your audience. This is even so much as stated in the Google Webmaster Guidelines. What content strategists know today is that the search engines love relevant content which leads to website referrals and traffic. So spending just a bit of time up front will make a difference in the content development stage. Think of it this way, you wouldn’t show up to give a presentation with thinking through what you wanted to say. You wouldn’t, right? 1. What is your brand narrative? What’s your story? Every company and organization has one and more often than not it is unique. Well, it certainly should be. Keep in mind that every good story has a protagonist and an antagonist. What does your brand stand for? Who or what is your nemesis? 2. Why are you doing this? Why now? If you are just jumping in to be on the bandwagon things probably won’t work out the way you think. Gone are the days where social media can be used to increase site traffic. Consumers are savvy and require an exchange of value (in the form of content) in order to start a relationship with your brand. Remember, this new inbound marketing game is not about you, at least not initially. 3. What is the goal? What does success look like? Think about goals, some examples are–more customers, increase retention/acquisition, build your advocacy voice, establish thought leadership in your expertise area? By thinking about goals and giving shape to them, it’ll make the building of audience messages that much simpler. This task will in turn lead to content ideas. 4. Who is the go-to content team? Who is responsible for what? What are the individual roles? Consider, if you haven’t already, looping in an executive leadership champion. This is someone who understands the value of content and social media marketing. This role will serve to educate, maybe take a few punches from their peers when the need arises to honor the commitment. 5. How are we going to manage this effort? Who are your content producers–your writers, bloggers, podcasters, photographers? Yes, it seems overwhelming but deciding the right size team and the proper ship will make all the difference. One guarantee is that the best tool will be the editorial calendar. Another solution is identifying and aligning internal and external content creators to help in sustaining the momentum. Yes, it often takes more than one but with the right pieces in place the content and social media equation can be solved. Remember, there is a perfect fit for your business. We can help answer these questions and partner with you to provide the right strategy and content in many forms. Experience, flexibility and marketing savvy. Short term. Long term. We are an experienced, flexible, freelance marketing resource that specializes in the delivery of marketing services and campaigns to a wide range of clients operating in the consumer space, products or services. The range of skills and services offered includes marketing-based services, like content strategy, copywriting for your business or customer-facing blog, branding to marketing planning advice and project management through to the execution of end-to-end integrated marketing campaigns for inbound and outbound marketing efforts. Zest’s philosophy is to bring a refreshing approach to your marketing communications, offering a different perspective with the ability to make things happen. New business start-ups who have no dedicated marketing resource, and have little time to devote to marketing activities. Small to medium sized businesses with limited marketing resource, or whose marketing department is over-stretched during busy demand periods. Corporate marketing departments requiring extra capacity but are under cost pressure and have no scope to recruit a permanent resource.